You’ve probably heard that there is a new Star Wars film currently making rounds in theaters. If you haven’t, well, either you just woke up from cryogenic sleep or you are one of those who don’t dwell much on the internet. The seventh episode in the Star Wars saga is currently on a record-breaking pace in the box office, so it’s also natural that most entertainment outlets are headlined by it in some form. 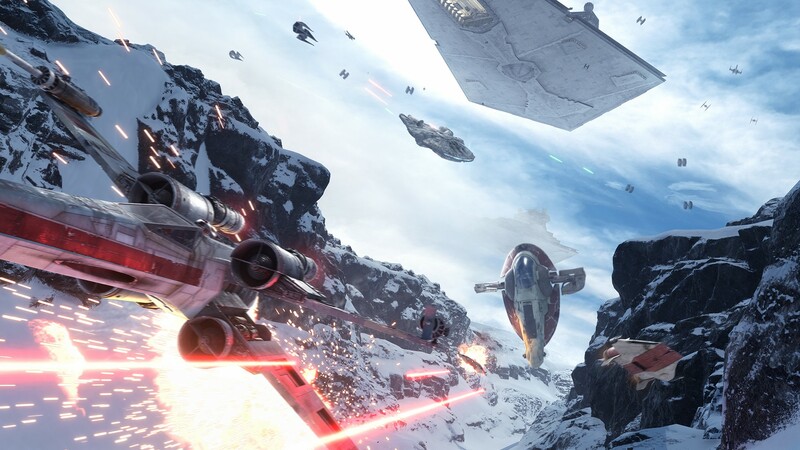 Joining Star Wars: The Force Awakens in dominating the entertainment industry at the moment is Star Wars Battlefront, developed by EA DICE — popularly known for their work on the Battlefield series. The way Star Wars: The Force Awakens is dominating theaters and Star Wars Battlefront racking up sales, which is boosted by the film’s present popularity, it’s safe to argue that the Star Wars brand currently has the entertainment industry on a choke-hold and has no plans to loosen up in the following weeks. Star Wars Battlefront was actually released before the new film and is mostly based on the original Star Wars trilogy (Episodes 4 to 6). The game had a tie-in DLC, Battle of Jakku (see trailer below), which takes place before the film’s events. But aside from that, the game takes its settings and characters from the previous films. There are currently four DLC packs in store for users, with the first one coming in 2016. The DLC packs, collectively, will contain new weapons, vehicles, Star Cards, multiplayer maps, and game modes, as well as four additional Heroes and Villains. The new characters are the most interesting because they are still veiled in mystery, but it will probably be another batch of popular characters in the Star Wars universe. It’s a bit odd that Star Wars Battlefront is not capitalizing to the max the current popularity of the film by producing DLC directly based on it. But it’s also worth noting that this installment in the rebooted Battlefront series is just the first and will be succeeded by multiple sequels. DICE may simply be reserving all those Episode 7 goodies for the sequels. Regardless of when the developers decide to release content based on Star Wars: The Force Awakens for Star Wars Battlefront (or its sequels), it will undoubtedly get fans to empty their wallets until the last character or vehicle from the film is safely integrated into their games. So, may the Force be with your wallets when that time comes.